Here is the continuation of our 10th Annual NanoBusiness/Nanomanufacturing Summit 2011 review from Tuesday, September 27th at the Seaport World Trade Center in Boston. Doug Jamison returned Tuesday morning to show us Solazyme’s roadshow video as an example of how nanotech companies are pitching themselves to investors. This led nicely into the day’s Keynote sessions featuring NNI veteran Mihail C. (Mike) Roco along with four more of our CEOs – Scott Rickert of NanoFilm, Jim Hussey of NanoInk, David Arthur of SouthWest NanoTechnologies, and Jim Phillips of NanoMech. Together with the day’s breakout session speakers, they painted a great picture of the breadth of successful business models and plans nanotech companies are executing. Scott Rickert http://www.ctnanobusiness.org/NanoBCA/wp-content/uploads/2011/10/Rickert-0927a.pdf started things off with a talk featuring five signposts on the road to nanotech’s success in its second decade. Scott’s business model at NanoFilm is focused on delivering commercial with today’s nanotechnology while progressing towards future nanotech that accomplishes what is now impossible. 1.It’s not just for rocket scientists anymore. Practical applications of nanotechnology abound, from environmental remediation to sunscreens and other personal care products. Scott regularly writes about today’s nanotech for IndustryWeek http://www.industryweek.com/Author.aspx?AuthorID=84, and under his guidance NanoFilm has been making products and profits with nanotechnology for over two decades. 2. Nanotechnology rearranges the map. While the forces of globalization have hurt many sectors of the U.S. economy, we are the center of the nanotech world. NanoFilm exports products, not jobs, to every continent while working with many international partners. Just as they have built a strong presence in Cleveland, other companies are enriching Des Moines, Tucson, Tulsa, Orlando, etc. – there is a nano presence in every region of the country. 3. Government agencies are putting more of their dollars into business partnerships and less into handouts. While stimulus packages kept some companies going, they are not the foundation of a sustainable business model. The government can be an important customer but make sure you understand what fraction of your business that represents and why. Government-sponsored research has long served to seed new companies, but when you are as old as NanoFilm (26) you need to be beyond that. Scott supports broad policies that encourage innovation and help many small and medium sized enterprises rather than targeted programs that support a few. 4. Nanotechnology is making the U.S. a manufacturing powerhouse again, not by filling 20,000 person automobile factories but through 100s of small and medium factories demanding skilled workers. The critical value of intellectual property in nano is a strong incentive for keeping production local – in your own country, and preferably in your own zip code. NanoFilm utilizes 80,000 sq. ft. of factory space in Cleveland and oversees the production of every product. 5. Nanotech bullies and crybabies are starting to have grown-up conversations. The discussions about environmental, health, and safety issues have taken on a new and more sophisticated tone. Regulatory agencies recognize that successful employers care about their workers, and are partnering with companies to develop and certify good EHS practices and procedures. In NanoFilm’s case, that means spending a lot of time talking to EPA and NIOSH. Scott’s vision for NanoFilm is based on a horizontal business platform similar to 3M or IFF. As a vertical producer he would have to compete with the GEs, DuPonts, and PPGs of the world. Instead, he concentrates on developing three classes of nanofilms – self-assembled, nanocomposite, and surface renewable – that are coated on to customer substrates. Every product is developed in response to a customer need, through a collaborative partnership. They compete based on performance, not price. NanoFilm’s customers are also sales partners – Scott only employs 5 salespeople, but there are over 30,000 technical and sales professionals selling NanoFilm coatings as part of products each and every one of us uses every single day. Dr. Mike Roco http://www.ctnanobusiness.org/NanoBCA/wp-content/uploads/2011/10/Roco-0927a.pdf, Senior Advisor for Nanotechnology at the National Science Foundation, was up next. Mike, who I have known for a decade, gave us his usual penetrating analysis of the trends in nanotech R&D. Mike views nanotechnology as U.S. industry’s best hope for a transformative platform and thinks we are at the beginning of changes in the industrial landscape similar in magnitude to the post-World War II era. He thinks we are poised to begin a 5-year transition from being science-based innovators to being product-based. But it will take intense research, especially in nanomanufacturing, to make this happen. (About 10% of NSF’s NNI budget will go to nanomanufacturing this year.) He urged us to include more of the human dimension in our development processes, concentrating on products for people, not products for products. Mike presented a wealth of information on indicators of R&D quality and intensity, including worldwide funding, citation, and patent data. From 2000-2010, patent applications have grown twice as fast as scientific papers. U.S. paper production continues to grow, but the growth has slowed compared to Korea and China in particular. Chinese nano papers now account for about 15% of its output in all research fields. The nano communities in the rest of the so-called BRIC countries (Brazil, Russia, and India) have also grown rapidly. The U.S continues its strong showing in quality indicators, such as the percentage citations in top-ranked journals. NSF has also analyzed some of the patents developed by nano researchers it has funded. The list is peppered with names that will be familiar to many of you, topped by Chad Mirkin and Rick Smalley. Mike moved on to discuss some of the nanotech applications showing the most promise today – catalysts, electronic devices, structural materials and coatings, energy storage, water filtration – and some of the most recent nanoscience advances that will drive tomorrow’s applications. These included a nanofabricated device from the University of California-Santa Barbara, which he called the first quantum machine; a new microscope developed at Caltech which can observe chemical reactions on the nanoscale with femtosecond resolution; and a new idea for energy storage based on graphite and water. By Mike’s count, about half the new energy conversion, storage, or carbon capture projects funded in the last decade incorporate nanotechnology, and there is already significant market penetration in major industries including semiconductors, pharmaceuticals, and catalysis. We are less far along than he had expected us to be in a few areas, such as materials by design, sustainable development, and public awareness. This is somewhat compensated by unexpected discoveries in areas such as plasmonics, metamaterials, synthetic biology, and quantum information technology. A strong international community is emerging in EHS and ELSI, but this needs to be expanded to include other governance issues such as investment policy and risk management. Continuing to look forward, Mike discussed the growth of public-private partnerships involving universities, industry, and government agencies. Just consider the area of nanoelectronics. In the U.S. we have the Nanoelectronics Research Initiative (NSF, NIST, SRC, multiple universities) and the SUNY/Sematech/NY State collaboration in Albany. Europe has the IMEC/Aachen/Eindhoven Triangle and the Grenoble Nanoelectronics Cluster. Japan has its own NRI, the Tsukuba Nano Center (AIST, NIMS, U. Tsukuba, NEC, Sharp, Toshiba, Hitachi & others). These kinds of hybrid partnerships are likely to form in other trending nano areas such as personalized nanomedicine, photonics, energy conversion and storage, and integrated biological and environmental studies. By 2020, we must be prepared for mass applications of not just nanomaterials but nanoscale devices and systems, often with biological components. We need new models for innovation as part of a greater emphasis on commercialization, with an emphasis on sustainable development, job creations, and returning value to society for its investments. And we need to develop and fund global institutions capable of addressing the full range of governance issues. Jim Hussey, CEO of NanoInk, returned us firmly to the commercial world with his talk entitled “How Do You Create and Build a Nanotechnology Company” http://www.ctnanobusiness.org/NanoBCA/wp-content/uploads/2011/10/Hussey-0927a.pdf. To Jim, success in that endeavor is defined not just through the development of safe, reliable, profitable products but by providing appropriate shareholder return; training, employing, and fairly compensating a skilled workforce; and contributing to the economy at local, state, and national scale. NanoInk’s trip down that road began with the licensing of dip-pen nanofabrication technology from Northwestern in 2001. An experienced entrepreneurial team brought in over $100M of private capital and began to build products and revenues. It took several years, but the technology they developed is wildly disruptive and quickly drew attention in the diagnostic and genomic communities. By reducing the amount of fluid needed by over 10 orders of magnitude, NanoInk can greatly reduce the cost and increase the performance of many kinds of biological assays. Their business is built on a mix of equipment and consumables sales, and is international. They have developed a specialized training instrument and accompanying courseware, called the NanoProfessor system, which foreign universities are snapping up quickly. Looking forward, the company may have an opportunity to break into an entirely new field as the semiconductor industry ponders the relative merits of continued miniaturization via optical lithography, known as More Moore, vs. incorporating new techniques and new functionalities, known as More than Moore. Jim, who has mentored many new entrepreneurs, closed with a few words of advice for other prospective company builders. He prefers private capital to government funding. Listen to what the customers want, it is what matters. And if you are the scientist, recognize that building product requires a different skill set than invention, so get out of the commercialization experts’ way. SouthWest Nanotechnology CEO Dave Arthur closed out the Tuesday morning keynote session. Dave told us how SWeNT has gone from producing a few grams of single-wall carbon nanotubes per day in its startup phase (2000-2005) to kg/day with the opening of a production plant in 2008 and on to as much as 10,000 kg/day today. They have built 5 successively larger generations of their vertical fluidized reactors while working closely with NIOSH and EPA to ensure that their plant and product are safe. SWeNT now has EPA consent orders in place authorizing them to manufacture both single-wall and multi-wall CNTs in substantial quantities. They are incorporating tubes into inks to fulfill customer desire for safe and easy handling. Through a partnership with the coating experts from Chasm (many of them ex-Polaroid), they have formulated products especially appropriate for roll-to-roll application. SWeNT has received important support from both Federal and Oklahoma government agencies, totaling $6M. They have also raised $13M in equity seed and A-rounds plus $5M in debt capital from the Norman economic development coalition. They are ready for another equity infusion and are planning on closing a B-round of about $15M in the first quarter of 2012. On the customer side, things are progressing but there is still a ways to go. Typically it takes a year to move customers past their early excitement about technology and performance, to the point where they define a complete, convenient solution meeting real product needs. The main target market now is thin films for electronics; composites applications in supercapacitors, batteries, and membranes remain tantalizing, but even at 1% loading will require far higher quantities of CNTs – tonnes per day – than SWeNT can currently provide. As a transparent thin film for touchscreens, SWeNT has licensed and is producing a CNT-bearing ink developed by Chasm. Called V2V, it is not only a cheaper material than traditional Indium Tin Oxide coatings but is less expensive to apply in the necessary pattern. The company also has a program, newly funded by the State of Oklahoma, to work with Chasm and Panasonic on semiconducting inks that could greatly improve the performance of OLED TVs. They also continue to develop differentiated nanotube products, including a tube variety with a very low defect rate and a narrow mix of chiralities. A greener, ultralow cost process for manufacturing single wall tubes is in an early stage of development; Dave hopes to fund it separately from the much more advanced thin film work. As conceived, this process would reduce energy usage by 95% and carbon dioxide emissions by 99%. It would be scaleable to 10 tonnes/day at a cost of $0.10/gm and could change the prospects for composite products dramatically. Tuesday morning continued with five company presentations in two parallel sessions, along with an update from David Bunzow http://www.ctnanobusiness.org/NanoBCA/wp-content/uploads/2011/10/Bunzow-0927a.pdf from Lawrence Berkeley National Laboratory on opportunities to use Department of Energy facilities and a talk by attorney Jeffrey Rosedale http://www.ctnanobusiness.org/NanoBCA/wp-content/uploads/2011/10/Rosedale-0927A.pdf from Woodcock Washburn on strategies for extending the lifetime of your intellectual property. You will find several of these presentations online, also, featuring Nanophase CEO Jess Jankowski http://www.ctnanobusiness.org/NanoBCA/wp-content/uploads/2011/10/Jankowski-0927a.pdf ,Cambridge NanoTech founder and ALD pioneer Jill Becker http://www.ctnanobusiness.org/NanoBCA/wp-content/uploads/2011/10/Becker-0927A.pdf, Contour Energy CEO T. Joseph Fisher http://www.ctnanobusiness.org/NanoBCA/wp-content/uploads/2011/10/Fisher-0927a.pdf, and Pixelligent CEO Craig Bandes http://www.ctnanobusiness.org/NanoBCA/wp-content/uploads/2011/10/Bandes-0927a.pdf. After lunch, Jim Phillips kicked off our final afternoon. Jim is the CEO of Arkansas-based NanoMech. As an active member of the Council on Competitiveness, Jim talks to a lot of innovators and he thinks some of us nano folks are a little too pessimistic. We need to remember that even in this second decade, nano is still in its infancy. NanoMech works closely with the University of Arkansas, which made a big investment in a new laboratory for nanotech just about the time Jim came on board. According to Jim, business success depends on talent, research, entrepreneurship, environment, partners, and access to capital. NanoMech has an international and interdisciplinary team, and a great environment for innovation. They are just down the street from Wal-Mart headquarters, which means they have 1,250 vendors as neighbors (200 with revenues above $1B/yr ). NanoMech has been operating with a new business model since January which emphasizes licensing; it is similar to BASF’s model. They are targeting global markets in fields such as energy, manufacturing, environmental, sustainability, defense and security, and biomedical. NanoMech would not be alive without the SBIR program, having received support at critical times from NSF and DOD. He cautioned us not to underestimate the value of government funding in the startup phase. The mix changes as a company evolves. NanoMech is now having great success with cubic boron nitride coatings for cutting tools. It took a while to capitalize on this technology, which significantly increases the lifetime of industrial tooling, but it will generate the equivalent of $130M in revenue through licensing this year. It is important to have a good intellectual property team when you are involved with deals like this, involving joint development agreements with partners much larger than you are. Marketing is also important. Jim discussed a few examples from his earlier successes in the telecommunications industry, such as coming up with the phrase “cable modem” to describe what technically should have been called a codec. A lot more people knew what a modem was than a codec. So that is what we all have today, cable modems. They faced a similar problem with the TuffTek cutting tool line. How many people in the machine tool industry can decipher an electron micrograph showing boron nitride and titanium layers? But they all get the point of the company’s “Tool that Lasts a Lifetime” campaign, which Jim placed in big spreads in key trade publications. To continue this theme, Jim told us that NanoMech is now buying up the trademarks for lots of “little ns”. For example, their product line of suspended solid lubricant nanoparticles has been renamed from Nanoglide to nGlide. Following Jim’s presentation, we broke into parallel tracks for two final commercialization breakout sessions before rejoining for a Washington Roundup. You will find Eeva Viinikka’s presentation http://www.ctnanobusiness.org/NanoBCA/wp-content/uploads/2011/10/Viinikka-0927p.pdf about nanotech commercialization and Mike Milburn’s overview http://www.ctnanobusiness.org/NanoBCA/wp-content/uploads/2011/10/Milburn-0927p.pdf of Metabolon’s metabolytics and diagnostic platforms on the web. 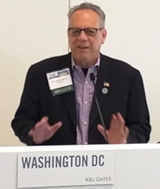 In the roundup, NanoBCA Advisory Board Members Joe Piche and Philip Lippel joined me for a lively discussion of the current situation in Washington. I began with some remarks about the Congressional budget wars, noting that the Technology Innovation Program at the National Institute of Standards was under fire just as its predecessor, the Advanced Technology Program had been for many years. It looks like new awards under this program, which has benefited several of our member companies, will be zeroed out in the 2012 budget. ARPA-E’s budget is likely to be well below the President’s Request for similar reasons. Phil and Joe noted that Congress’ unease at funding programs with such close ties to industry does not seem to be mirrored in other countries (with the possible exception of the UK), potentially putting U.S. firms at a competitive disadvantage internationally. The overall budget situation for the agencies participating in the NNI is not quite so bleak – once the House and Senate get together, the total R&D funding is likely to be about 6% below the President’s request. If you are interested in following the details of how the budget battles affect R&D, Phil recommended that you keep an eye on the AAAS budget and policy http://www.aaas.org/spp/rd/fy2012/ program website. For now we are assuming that NNI funding will probably come in at about that same figure, 6% or so below the requested $2.1B. But dollars aren’t the whole picture. Most of the agencies have not received final appropriations and have been operating under continuing resolutions, which makes it very difficult to start new programs. It remains to be seen if this will slow down the funding transitions Drs. Tinkle and Roco told us about, or if the agencies will find ways to begin adjusting their priorities within existing programs. I want to thank all the participants and attendees for two stimulating days in Boston. Many of us also enjoyed our overlap with the Water Innovations Alliance and Foundation Conference http://www.waterinnovations.org/presentations2011.php and with the Academic-Industry Workshop on Nanofabrication Techniques for Roll-to-Roll http://www.internano.org/r2rworkshop/ Manufacturing hosted by our National Nanomanufacturing Network colleagues.